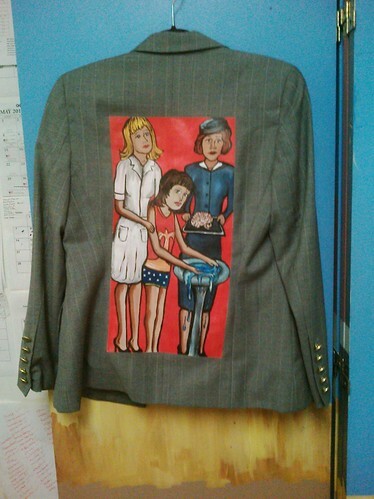 Before leaving DC to attend Health 2.0 in San Francisco, I finished painting Janice McCallum’s jacket. Though a series of emails I learned that she quite admired @cyberslate’s jacket with its Wonder Woman motif, and was saddened that she could not have that avatar upon her back. As our correspondence continued, I learned more about Janice. I learned that her father had brain surgery when she was only a babe of six months. I learned that Janice has always been interested in medicine since she was a small child, but as a girl growing up in the sixties well meaning adults thought that meant her interest would lead her into nursing. 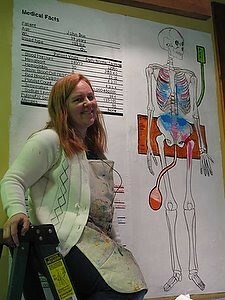 Janice stayed interested in medicine and this led her into the world data aggregation. She realized early on that the electronic medical record is the patient story. She lives within the many worlds of social media following multiple conversations. She discusses trends and controversies within health policy, pharma, provider and patient communities. 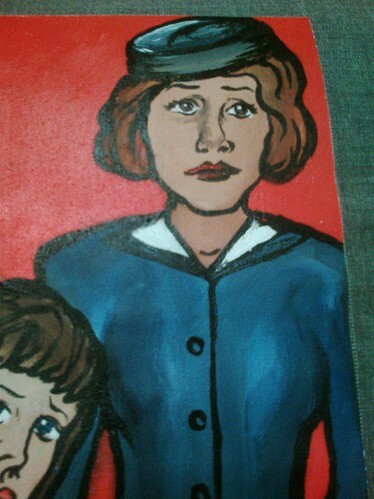 She told me all of these things, and I painted her thus. The Armor We Wear: Janice McCallum’s jacket. Do you remember Underoos? The product was developed in 1977 and the concept was simple. Underneath their regular cloths little boys and girls could have underwear that was designed to look like a super hero costume. In 1980 many girls and boys proudly wore underwear that acclaimed look at me, “I am Wonder Woman or I am Superman!” And they often wore it at home without the protective outer layer of clothes of Diana or Clark Kent. The commercials even seemed to normalize such behavior. I took one look at it and knew it was dangerous. I was only eight years in 1980 but I knew it was not safe to walk around in underwear. We were safer in street clothes. That was the armor we wear. But in this painting I depict a young Janice dressed only in Underoos standing by a fountain. You see Janice speaks openly in the transparent and eternal world of social media and the armor she wears is her bravery and honesty. She stands up for patients while wearing her “unmentionables.” She is washing her hands within the painting in an over-flowing fountain. Here liquid data spills in an ever-flowing stream of twitter updates and conference posts. 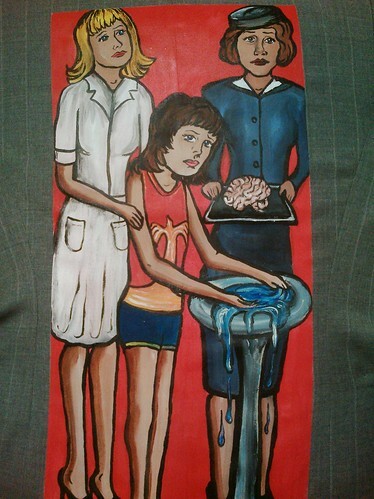 Behind Janice a Pan-Am stewardess holds out a tray with a brain upon it. 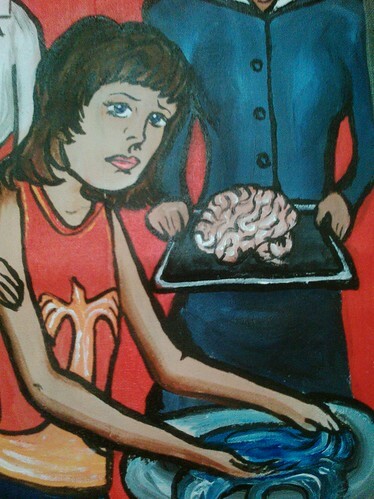 This represents both her father’s procedure and her own decision to develop her brain over her brawn. To Janice’s left a nurse stands, offering her another life path as a caregiver. 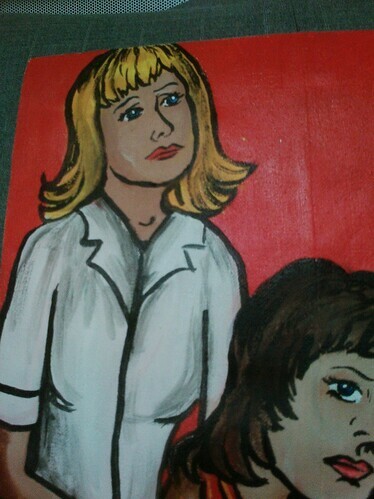 The nurse looks with a troubled countenance into the distance. Perhaps she would have chosen another direction: a life as a doctor or data technician if she had been born in a later time. 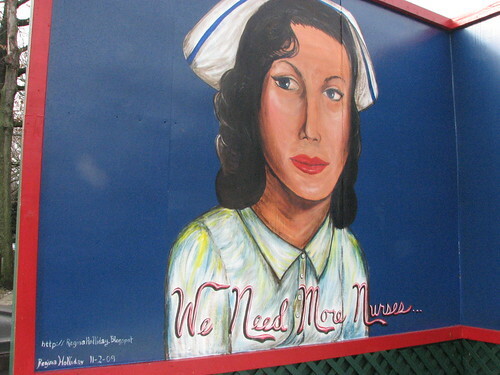 Nursing is a grand and noble profession, but it is a calling and it is not for everyone. All three figures have feet chopped off within the frame; this represents the hobbling that still exists within many professions for the female employee. All three have faces that show concern and worry. But they are brave, and each walks forward into life helping others, costumed by the armor they wear.